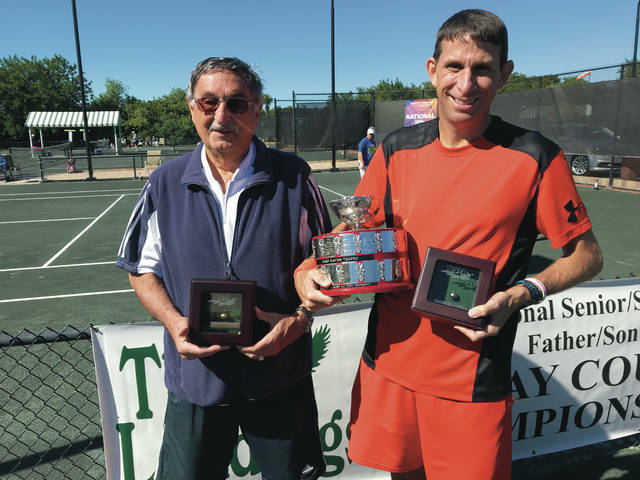 Jason Homorody, right, and his father Peter pose with their trophy after winning an 80-and-over, father-and-son national doubles tournament last month in Sarasota, Florida. Delaware resident Peter Homorody and his son Jason, who lives in Lewis Center, have accomplished a ton on the tennis courts. Jason graduated from Ohio State where he was All-Conference in tennis. He currently teaches the game for a living at Elysium Tennis. Peter, meanwhile, is an assistant coach for the Denison men’s team … at 80 years young. That’s right, 80. But what they’ve done apart is nothing compared to what they’ve done together, like complete the prestigious Golden Slam by winning a national tournament last month in Sarasota, Florida. What’s the Golden Slam, you ask? Well, in the 80-and-over (father has to be at least 80 years old), father-and-son nationals there are three tournaments. The first is on hard courts in Claremont, California in June. The second is on grass courts in Long Island, New York in August and the third leg, the one the duo just won, is on clay courts in mid-November in Sarasota. Win all three and nab the Golden Slam, like Jason and his dad did. The win was the eighth national title for the duo over the course of their 20 years competing together. Sarasota was a big one in that is wrapped up the slam, but Jason said his favorite this year was the one played in California. What made it even more special was that it came after a bit of a hiatus. “We hadn’t played a tournament together in six years and that was our first tournament back,” Jason said. “I hadn’t been playing competitively in four years so we had a little rust to shake off. Plus, we were only going to go to the next tournament if we won the first tournament. Jason said his dad was a huge influence, but didn’t force feed him the sport. He got into tennis because he wanted to and, well, plays it the way he wants to, too. “It’s funny that even though my dad is a coach and has given me lots of good advice, I was always very stubborn and liked to do things my own way,” he said. “I play a unique style of hitting two hands on both sides while he plays a more classic style of one-handed on both sides. Being able to play the game he loves with his 80-year-old dad is as good as it gets, Jason said.